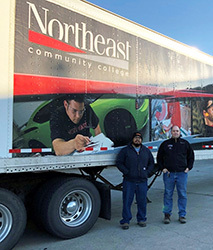 by amandab 2/11/2019 9:18:36 AM -- NORFOLK, NE - A recent trip from Nebraska to Georgia gave a Northeast Community College truck driving student an opportunity to pick up some equipment for the College--and gain some valuable real-world experience. Student David Reyes, Norfolk, along with Ed Lewis, Northeast truck driving trainer, traveled 1,067 miles one-way to Rome, GA, and back again to pick up new welding stations from Clean Air America, Inc. The units will be used in the welding program at the College’s new West Point Technical Center. Lewis said the experiences these trips afford his truck driving students is invaluable. Even the smaller, seemingly mundane incidents that arise during that trip can provide big learning opportunities along the way, Lewis said. Lewis said the journey to pick up the welding stations, which took him and Reyes through eight states upon arrival and seven on the return over the course of four days, offered a number of challenges from the beginning. Lewis and Reyes encountered three-foot snowdrifts while exiting the lot on the Northeast campus and multiple smaller drifts through the first 75 miles of the trip. They also drove through heavy traffic in Kansas City, MO, and were routed directly through downtown areas in St. Louis, MO, and Nashville, TN. Reyes even had the opportunity to navigate through two-lane mountain highways in Georgia. The return journey became a lesson in balancing weather conditions with safety regulations as Lewis and Reyes neared Missouri. Lewis said the truck driving program at Northeast completes approximately one or two long trips each year and also makes frequent, smaller trips of about 400 miles each. Most of the products being transported have been purchased by Northeast or are being transferred between locations. All students enrolled in the six-week Professional Truck Driver Training program have the opportunity to complete over-the-road experiences as part of their training. Job opportunities for commercial truck drivers are expected to grow by 15.9 percent in Nebraska by 2022, according to the Bureau of Labor Statistics. The American Trucking Association estimates a truck driver shortage to surge to 239,000 by 2022. Northeast Community College offers students the opportunity to learn the skills necessary to obtain a Class-A Commercial driver’s license to operate a semi over the road. For more information about the truck driving program at Northeast, contact Donna Andrew at (402) 844-7216, or donnaa@northeast.edu.